A new study of the impact of religion on the minds of growing children reveals a disturbing finding: When religion dominates, kids fare poorly in science and mathematics. The study offers a hint of things to come in the United States, where the government is now controlled by a party eager to hand off education to church schools while simultaneously declaring an allegiance to improving the nation’s economic competitiveness. With the Department of Education headed by a confirmed Christianist who made her billions off private schools, the outlook is bleak for our children. The more religious people are, the lower children in that country perform in science and mathematics, according to new research at Leeds Beckett University. The research [$35.95 to access] , published today in the academic journal Intelligence, reveals that more religious countries had lower educational performance in science and mathematics. The study also shows that levels of national development and time spent on religious education played a role in students’ attainment. The research, led by Gijsbert Stoet, Professor of Psychology at Leeds Beckett, alongside David Geary, Curators’ Professor in the Department of Psychological Sciences at the University of Missouri, is relevant for the government’s announcement in the budget that it will be investing £320 million into new free schools, including faith-based schools. Professor Stoet explained: “Science and mathematics education are key for modern societies. Our research suggests that education might benefit from a stronger secular approach. In that context, the current UK policy of investing more money in faith-based should be reconsidered. The researchers combined data from the Programme of International Student Assessment (PISA), OECD’s Education at a Glance, the Trends in International Mathematics and Science Study (TIMSS), the World Values Survey, the European Social Survey, and the United Nationals Human Development Report. Analysis of the data sets allowed conclusions to be drawn about international levels of religiosity, schooling and educational performance, and levels of human development (measures in regard to health, education, and income). Levels of religiosity were determined using representative questionnaires carried out around the world in the World Values Survey and the European Social Survey among the adult population. Levels of school performance in mathematics and science literacy were based on scores from children aged between 14 to 15 years old. Considering the relationship between religiosity and educational performance, the findings suggest that by engaging with religion, this may lead to a displacement of non-religious activities. Although relatively few countries have data on the time spent on religious education, it appears that the time spent on religion has a negative correlation with educational performance in mathematics and science. With the Trump Administration rapidly dismembering the Environmental Protection Agency, a new report reveals just why protecting the environmental saves lives, especially young ones. More than 1 in 4 deaths of children under 5 years of age are attributable to unhealthy environments. Every year, environmental risks – such as indoor and outdoor air pollution, second-hand smoke, unsafe water, lack of sanitation, and inadequate hygiene – take the lives of 1.7 million children under 5 years, say two new WHO reports. 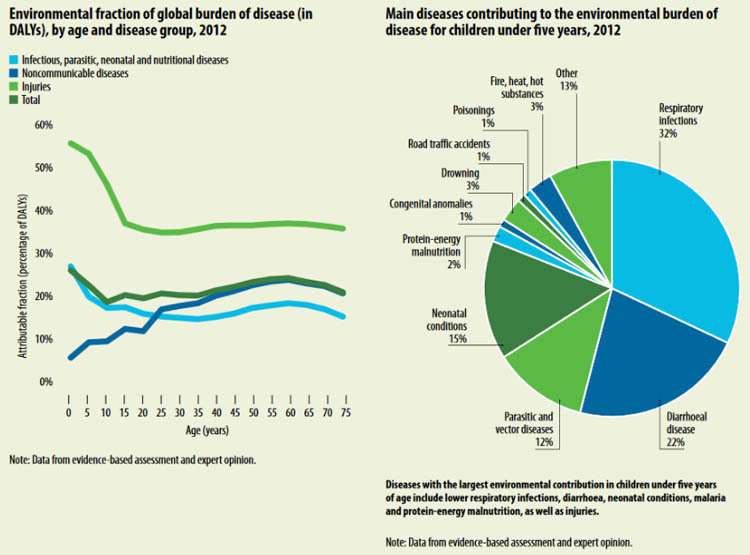 The first report, Inheriting a Sustainable World: Atlas on Children’s Health and the Environment [open access] reveals that a large portion of the most common causes of death among children aged 1 month to 5 years – diarrhoea, malaria and pneumonia – are preventable by interventions known to reduce environmental risks, such as access to safe water and clean cooking fuels. And we mean fight literally. A wonderful documentary from Jayisha Patel of Australia’s SBS Dateline, a look at Fareeha, a remarkable young Indian women skilled in a very untraditional martial art struggling to make her way to the national championships. It’s a story about a person from Hyderabad whose dream is to become a police officer so that she can protect young girls in a nation riven by religious and sexual violence. Her struggle reveals tensions universal in modern life, created when cultural norms created in an era of slow travel and limited technology were evolved at a time when organized religion dominated all aspects of civic and familial life. While the West dubs the struggle triggered by America’s armed imperialism Islamist, what has happened in the U.S. and Europe might be called a Christianist insurgence. While authoritarianism in the Mideast and North Africa is fueled by an authoritarian interpretation of the Koran and sayings attributed to the Prophet, while the authoritarianism of the West is inspired by an authoritarian interpretation of the Bible, relaying heavily on particularist selection of passages from practices proscribed by Torah and a vision of the imminent future taken from Revelation. The cultural norms struggles against are not so different than the gender-based laws many Republicans dream of enacting. And when you look at how the Christianists really want to control women and their roles, is it really that different from what the Islamists want? In that context, enjoy a remarkable, true story about a triumphal struggle. What happens when cultural tradition clashes with a young person’s dream? Dateline meets a Muslim girl whose passion for martial arts is raising difficult questions for her family. 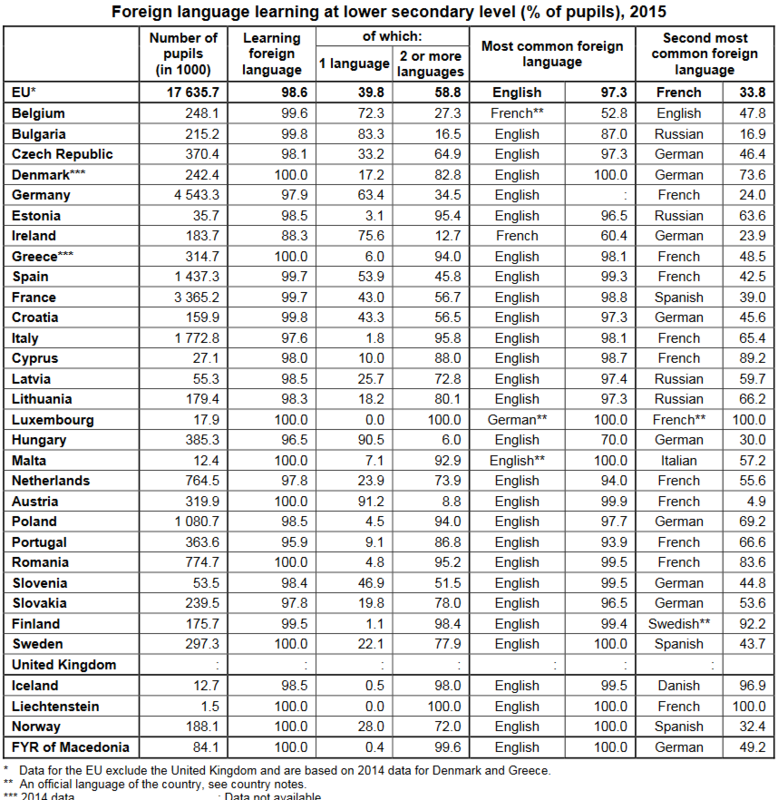 Learning a foreign language at school is very common in the European Union (EU), with more than 17 million lower secondary school pupils (or 98.6% of all pupils at this education level) studying at least one foreign language in 2015. Among them, more than 10 million (58.8%) were studying two foreign languages or more. English was by far the most popular language at lower secondary level, studied by nearly 17 million pupils (97.3%). French (5 million or 33.8%) came second, followed by German (3 million or 23.1%) and Spanish (2 million or 13.6%). These data are issued by Eurostat, the statistical office of the European Union. Currently there are 24 official languages recognised within the EU. In addition there are regional languages, minority languages, and languages spoken by migrant populations. It should also be noted that several EU Member States have more than one official language. In 2015, all or nearly all lower secondary school pupils learnt at least two foreign languages in Luxembourg (100%), Finland (98.4%), Italy (95.8%), Estonia (95.4%) and Romania (95.2%). In contrast, fewer than 10% of pupils were studying two or more languages in Hungary (6.0%) and Austria (8.8%). English is by far the main foreign language studied during lower secondary education in the vast majority of Member States. In particular, all pupils attend English classes in Denmark, Malta and Sweden. French is one of the two main foreign languages studied by all pupils in Luxembourg and is also the top foreign language studied in Ireland (by 60.4% of pupils) and Belgium (52.8%). In addition, French is the second most popular foreign language studied at lower secondary level in nine Member States, with the highest shares of learners recorded in Cyprus (89.2%), Romania (83.6%), Portugal (66.6%), Italy (65.4%) and the Netherlands (55.6%). Besides being studied by all pupils in Luxembourg, German ranks second in eight Member States, with the highest shares being registered in Denmark (73.6%), Poland (69.2%) and Slovakia (53.6%). Learning Spanish is notably popular in Sweden (43.7%) and France (39.0%), while Russian, the only commonly studied non-EU language, came second in the three Baltic States – Lithuania (66.2%), Estonia (63.6%) and Latvia (59.7%) – as well as in Bulgaria (16.9%). Meanwhile, across the Atlantic. . .
[T]he U.S. does not have a nationwide foreign-language mandate at any level of education. Many states allow individual school districts to set language requirements for high school graduation, and primary schools have very low rates of even offering foreign-language course work. Some foreign-language learning standards can be met by taking non-language classes. For example, California requires one course in either the arts or a foreign language (including American Sign Language) for all high school students. Oklahomans can opt to take two years of the same foreign language or “of computer technology approved for college admission requirements.” Conversely, New Jersey students must earn “at least five credits in world languages” or demonstrate proficiency in a language other than English before they can graduate high school. Perhaps because of these varying standards, few Americans who claim to speak a non-English language say that they acquired those skills in school. Only 25% of American adults self-report speaking a language other than English, according to the 2006 General Social Survey. Of those who know a second language, 43% said they can speak that language “very well.” Within this subset of multilinguals who are well-versed in a non-English language, 89% acquired these skills in the childhood home, compared with 7% citing school as their main setting for language acquisition. Q: What do you call someone who speaks three languages? Q. What do you call someone who speaks two languages? Q. What do you call a person who speak one language, and that badly? 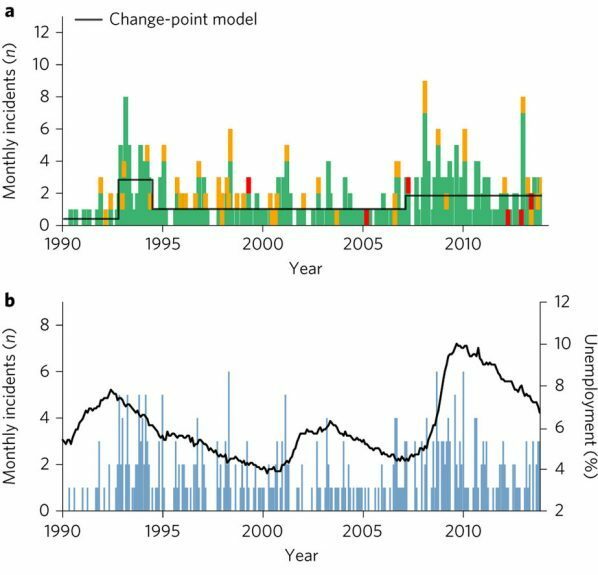 Two charts from the report [open access] featuring [top] the monthly number of shooting events categorized based on number of fatalities [green 0–1, orange 2–5 and red >5] and [below], national unemployment rate peaks [black line] and how they qualitatively align with periods of elevated rates of school shootings [blue bars]. While there are other facts at work in individual cases, ranging from psychopathology and poor home relationships to immediate provocations, could high jobless rates play a key role in America’s school shootings? A rigorous Northwestern University study of a quarter-century of data has found that economic insecurity is related to the rate of gun violence at K-12 and postsecondary schools in the United States. When it becomes more difficult for people coming out of school to find jobs, the rate of gun violence at schools increases. The interdisciplinary study by data scientists Adam R. Pah and Luís Amaral and sociologist John L. Hagan reveals a persistent connection over time between unemployment and the occurrence of school shootings in the country as a whole, across various regions of the country and within affected cities, including Chicago and New York City. Frequent school shootings have been a major concern in American society for decades, but the causes have defied understanding. The Northwestern researchers used data from 1990 to 2013 on both gun violence in U.S. schools and economic metrics, including unemployment, to get some answers. “Our findings highlight the importance of economic opportunity for the next generation and suggest there are proactive actions we could take as a society to help decrease the frequency of gun violence,” said Pah, clinical assistant professor of management and organizations at the Kellogg School of Management. While Chicago is singled out in the study as one of the six cities with the most incidents from 1990 to 2013, Chicago schools are not any more dangerous than schools in other large cities. Gun violence at schools has not become more deadly over time. Most shootings are targeted, with the shooter intending to harm a specific person. Gang-related violence and lone mass shooters comprise only small fractions of the gun violence that occurs at U.S. schools. Gang-related violence constitutes 6.6% of all incidents. The results suggest that during periods of heightened unemployment, increased gun violence may be a growing risk in American college and university settings. The study, Economic Insecurity and the Rise in Gun Violence at US Schools, [open access] was published Monday by the journal Nature Human Behaviour. The research team also found the rate of gun violence at schools has changed over time. The most recent period studied (2007-2013) has a higher frequency of incidents than the preceding one (1994-2007), contradicting previous work in this area. This is a unique contribution made possible because of the researchers’ backgrounds in data science and modeling. And in California, too — albeit in the conservative Central Valley. A California high school substitute teacher was banned from the Clovis Unified School District after wearing a Black Lives Matter pin to class last month, local media reported Saturday. After working as a substitute teacher for the district for more than 15 years, Robert has now been banned from working in any of the district’s schools according to an incident report issued last month and seen by the newspaper. The report claims that Roberts was wearing a “political” button which offended some of the students while also accusing the substitute teacher of not following the lesson plan, which he denied. “A pin that reads ‘Black Lives Matter’ is not a political button. It is a peaceful request to end this violence,” Roberts said asserting that his firing from the district was solely related to the button. How would Americans like it if, say, North Korea dictated a law barring criticism of that country on U.S. campuses. We imagine lots of folks would get righteously upset. But an Israeli propagandist and former Deputy Prime Minister has done just that. After Donald Trump’s election emboldened white supremacists and inspired a wave of anti-Semitic hate incidents across the country, the Senate on Thursday took action by passing a bill aimed at limiting the free-speech rights of college students who express support for Palestinians. By unanimous consent, the Senate quietly passed the so-called Anti-Semitism Awareness Act, only two days after it was introduced by Sens. Bob Casey, D-Pa., and Tim Scott, R-S.C. Critics have pointed out that those are political — not racist — positions, shared by a significant number of Jews, and qualify as protected speech under the First Amendment of the Constitution. According to the draft, the bill does not adopt the definition as a formal legal standard, it only directs the State Department to “take into consideration” the definition when investigating schools for anti-Semitic discrimination under Title VI of the Civil Rights Act. Now why do we say that the law is the creation of an Israeli propagandist? That’s because those key words — demonizing, delegitimizing, demonizing — are the formula created by Israeli political propagandist, Natan Sharansky, a former Israeli Deputy Prime Minister and Minister for Jerusalem and Diaspora Affairs and a good friend of Sheldon Adelson, the zealous Ziocon and Las Vegas casino magnate, and newspaper publisher who poured $25 million into a Trump-supporting PAC and sits on Trump’s inauguration committee. Sharanksy,’s formulation is a brilliant semantic coup, employing words of such vagueness that they can be applied to virtually any critic of Israeli policies. We know that, because they have been applied to us, repeatedly, first when reporting on the actions of a campaign launched against the Berkeley Daily Planet, a paper that came under fire from a motley crew of militant Ziocons angry because the paper published letters critical of Israeli government policies toward its Palestinian population. Attesting to the brilliance of Sharansky’s word-spinning is the fact that it was adopted as the adoption of that very definition of antisemitism by the State Department under Hillary Clinton. Surely it’s legitimate to criticize the actions of a government which clearly applies double standards by seizing land and homes of non-Jewish citizens while not taking the same actions toward the property of its Jewish citizens. Similarly, one could question’s Israel’s legitimacy, given that the state was created as the result of an accord between by the British and French governments without the consent of those who lived their, the majority of them not Jewish. As for demonizing, what word could be more vague?